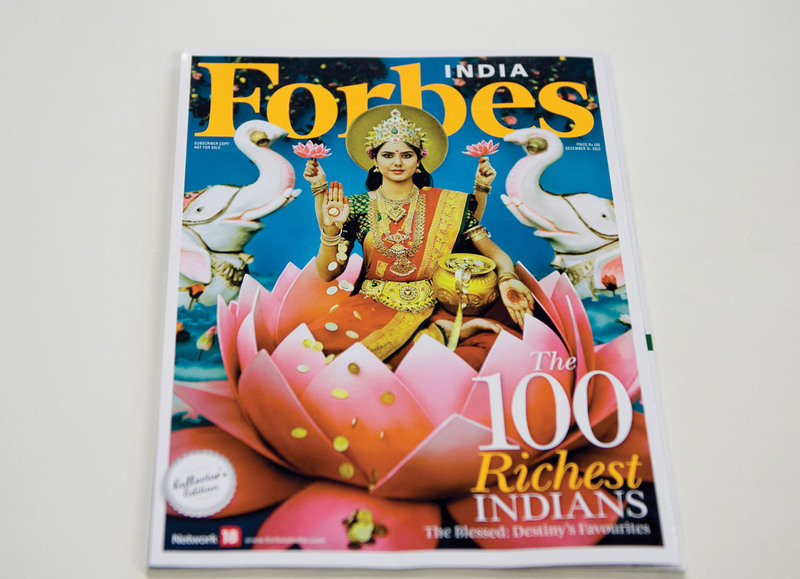 Forbes India Magazine has a collectors edition flagship issue of 350 pages every year. This year their focus was a comprehensive list of the 100 Richest Indians. I was invited by Anjan Das, Art Director of Forbes, for a really thrilling collaboration. Right this moment India is enthusiastically celebrating Diwali—the festival of lights. It’s a festival where the primary Goddess worshipped and celebrated is Maa Laxmi. Anjan saw the image of Maa Laxmi from my series ‘Darshan’ and found it to be a perfect fit for the face of the issue. Knowing his highly skilled production value on the paper and six-color printing complete with gold foiling, Anjan Das really took the finished product to the next level. You can read about our story on my blog here, and this cover also made it to the most popular on Coverjunkie this month.